The research was done in the laboratory of Michael Elowitz, professor of biology and biological engineering and a Howard Hughes Medical Institute investigator. A paper describing the work appears in the September 21 issue of the journal Science. Synthetic biology is the study of how to engineer cells to give them new functions, from simple tasks like blinking on and off periodically to more complex programs such as detecting and responding to disease states. Typically, this is done by editing the cell's genome, producing a permanent modification that gets passed down when the cell replicates. A major goal in synthetic biology, according to Elowitz, is to shift this paradigm toward less genetically permanent solutions. 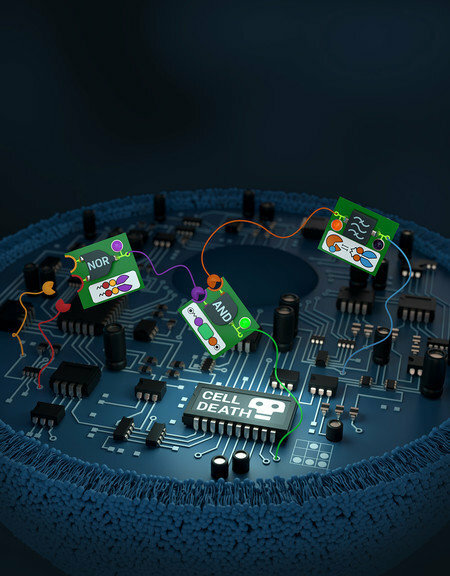 Like using removable tape instead of super glue, the aim is to develop therapeutic "circuits" that could be administered, carry out a function, and then go away once their purpose has been served. Ideally, these would be highly targeted; instead of affecting all cells indiscriminately, the therapeutic circuits could detect when something goes wrong on the cellular level and fix it accordingly.